The students at Donna Lee Loflin are excited to participate in the annual Hour of Code! Our school will be coding during the week of December 10-14, 2018. That’s why our entire school is joining in on the largest learning event in history: The Hour of Code. More than 100 million students worldwide have already tried an Hour of Code. Our Hour of Code is making a statement that Loflin is ready to teach these foundational 21st-century skills. 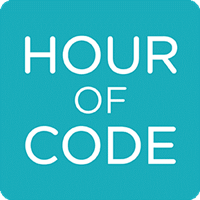 To continue bringing programming activities to your students, we want to make our Hour of Code event huge. Stay tuned for pictures of our school-wide event! To volunteer to help out or share your knowledge with our students, please call the front office at 336-625-1685. Essential Standard: Remember safety and ethical issues related to the responsible use of information and technology resources. - Identify examples of responsible use and care of technology hardware and software. - Remember internet safety rules. - Recognize the importance of respect for the work of others. Essential Standard: Understand safety and ethical issues related to the responsible use of information and technology resources. - Use technology hardware and software responsibly. - Explain why safety is important when using the Internet. - Recognize the need to obtain permission or give credit when using intellectual property of others. Essential Standard: Understand issues related to the safe, ethical, and responsible use of information and technology resources. - Explain why safe use of electronic resources is important. - Use simple citation rules for print and electronic resources. - Understand the guidelines for responsible use of technology hardware. - Understand ethical behavior (copyright, not plagiarizing, netiquette) when using resources. - Understand internet safety precautions (personal information, passwords, etc.). - Understand ethical behavior (e.g., copyright, not plagiarizing, netiquette) when using resources. - Understand internet safety precautions (e.g., personal information, passwords, etc. ).